A South African braai wouldn’t be the same without the perfect side dish, right? Well, why not take your braai up a notch with this Spicy Chakalaka Potato Bake; a delicious spicy twist on the traditional potato bake. This dish is a super tasty accompaniment for any meaty meal as well as a great option for our much-loved vegetarian guests. #TIP: Peel and slice the potatoes the night before your braai, luncheon or dinner party. Store the slices in a bowl of water (make sure the water completely covers your potatoes). This will cut your prep time in half and gives you more time to spruce your place up a bit! Rinse and peel the potatoes. Cut the potatoes into evenly thin slices. Place the potato slices into a bowl and season with curry powder, parsley, spring onions, salt and pepper. Shake the bowl a couple of times in order to mix the seasoning well. Pour the Rhodes Chakalaka Mild & Spicy into an ovenproof casserole dish. Arrange neat layers of potato slices on top of the Rhodes Chakalaka. Evenly pour the cream over the potatoes. 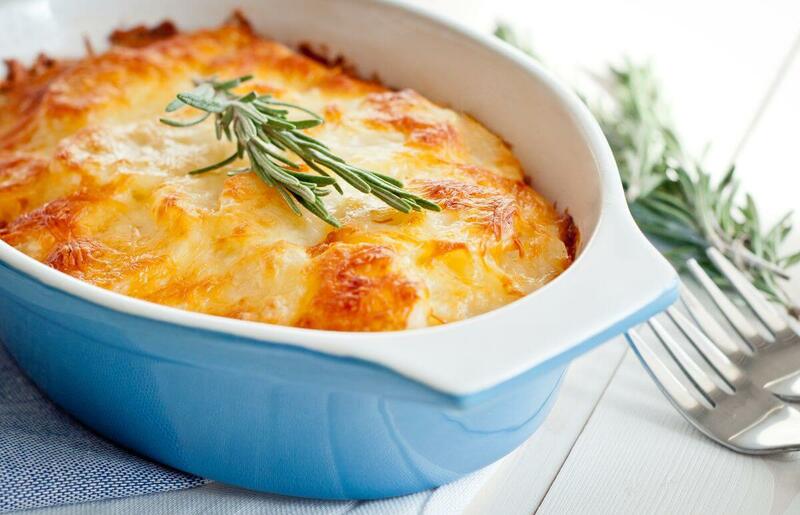 Bake the potato dish for 30 to 45 minutes, or until the potatoes are tender and the top is golden brown. Cut into portions (optional) and serve hot. If you enjoyed this recipe, then be sure to check out our Winter Delight recipe here.